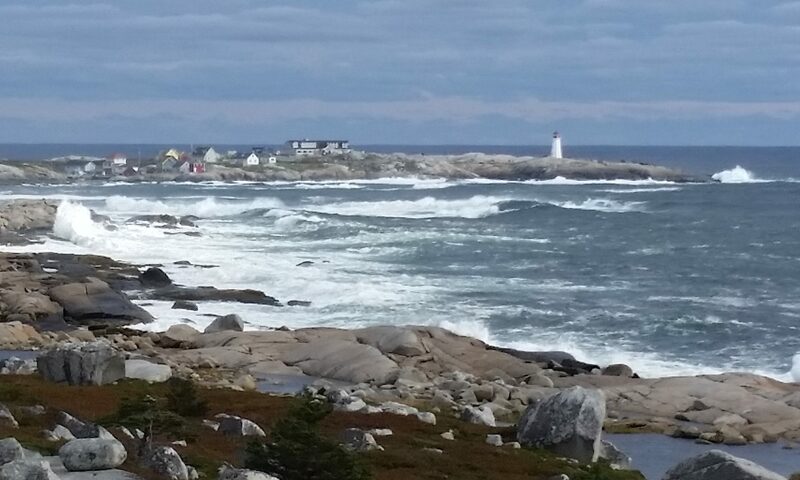 Yesterday I went on a tour of Windhorse Farm, a sustainable farming and forestry operation located up the LaHave River from Bridgewater. I was most curious to see their brush walls. When I first heard about Windhorse’s brush walls last winter, a light went on in my head. Here was the answer to several of my problems, including the strong north wind chilling the garden, and large amounts of brush available. 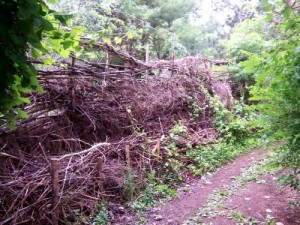 Windhorse’s brush walls are piles held in place by stakes 6 feet apart, making a thick wall. As the brush gradually breaks down, more is piled on top. Vines such as squashes and grapes are encouraged to climb over the brush, and in summer, the brush walls can be completely hidden by vegetation. My picture also shows a higher brush fence that has been woven around taller stakes. In fact, it’s about 7-8 feet high, high enough to keep out deer. The brush walls contribute greatly to the success of Windhorse’s garden. They enclose and shelter it, holding in heat. The decomposing brush adds to the fertility of the soil. And very importantly, the brush walls provide habitat for all sorts of wildlife, including the friendly critters that help control garden pests. Click here for a description and a rather old low-res video about Windhorse’s brush walls. I started building a brush wall last spring and will continue to develop it. The deer netting is practically invisible so I've run three levels of flagging tape around it so the deer will know that something is there. 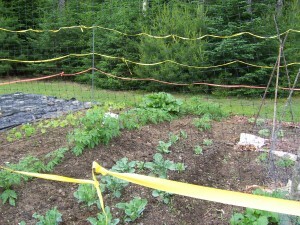 My deer fence looks like a carnival, the thin mesh festooned with orange and yellow flagging tape. What’s inside is not terribly tempting to deer, not yet anyway. It may not be big news for hungry humans either. The potatoes should do OK, and I hope to get some beans – especially if we get a bit of heat around here. 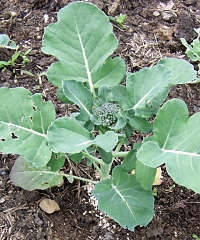 But when your broccoli matures early with heads the size of a loonie, you know the plants are feeling stressed. They somehow know that under these conditions, they’d better reproduce while they can. This broccoli plant has given up already. It doesn't think it'll grow big enough to support a floret larger than a loonie. How many pioneers tried to feed their families out of soil no better than this? Recently forested, no topsoil brought in, rocky, no manure integrated into the dirt yet – not much good for anything but potatoes. It takes time to build up soil like this – plus compost, manure and other organic matter. My ambition is to enlarge the garden with time. Newspaper and black plastic are smothering the weeds in future sections of garden. I’m sure glad I can BUY my groceries!